Works Well For Retriever Training Or A Fun Romp With Any Canine Friend! Bouncy and durable. A solid ball, made in the USA of nontoxic, natural rubber. Measures 3-inches in diameter and is recommended mostly for larger dogs. "We've had this Kong ball for almost a month and I think it's the best investment we've made on a dog toy. It still looks brand new...no signs of wear at all." "Would recommend this ball for anyone who has a big dog that likes to chew." 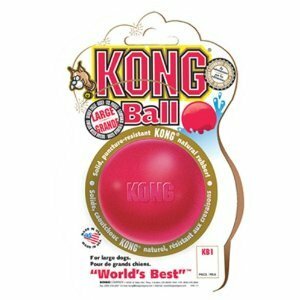 Thank you for stopping by our Dog KONG Toys: KONG Ball page!